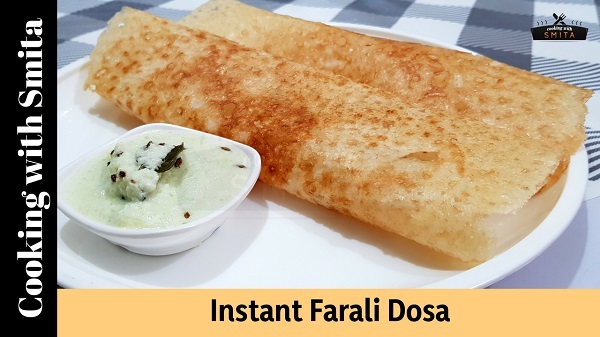 Here I’m sharing another Fasting Food Recipe – Instant Farali Dosa, you can eat during Upvas and fasting days like Shravan & Navratri. This Dosa made from Sabudana and Moraiyo, also known as Samo or Sama Ke Chawal. This Upvas Dosa recipe is so easy to cook, and it takes just 10 minutes to make. Grind Sabudana & Moraiyo together in a mixer grinder. Add the ground mixture in a large bowl, add Curd & Rock Salt, mix well. Add water as required and prepare the batter for Farali Dosa. I’ve added approx. 2 cup water to prepare the not-so liquidy batter. To cook Dosa, first heat dosa pan on medium flame. Spread some clarified butter on the pan using a tissue paper. Sprinkle some water on hot dosa pan and wipe with a dry cotton cloth. Evenly spread Dosa Batter on the hot pan. Apply some clarified butter and spread evenly. Cook dosa until crispy and golden brown. When dosa is cooked from all sides and becomes crispy, it will be easy to remove from the pan. Place Instant Farali Dosa directly in serving plate. Serve Farali Dosa with Upvas Chutney.